It was a revelation that shook Younger fans to their core, but when Charles found out about Liza’s secret in the season-five premiere, he was … oddly chill about the whole thing. He consulted a lawyer. Kept his head down. Generally avoided interacting with Liza. The usual! But at the end of this week’s episode, “The End of the Tour,” it all finally blows up: Charles has a brutal confrontation with Liza on the streets of Manhattan, where he brands her as a liar whose betrayal will have insufferable consequences for his feelings and Empirical Publishing (but mostly his feelings). 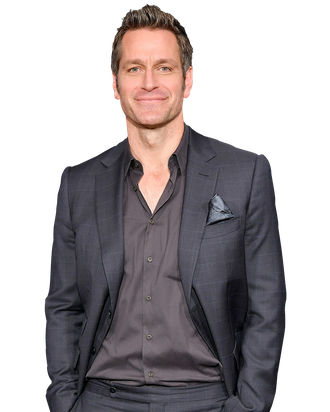 Reeling from the drama of it all, Vulture called up Peter Hermann to get the intel on what filming the scene was like — very cold! — how he and Sutton Foster approached the confrontation, and what this means for the duo going forward. It’s okay to be optimistic, Charliza ‘shippers. Charles is such an astute guy, I was surprised he didn’t have an inkling about Liza’s real age until the season premiere. Age is such an interesting spectrum. I think, simply, the idea of Liza misrepresenting herself is really far out there. The notion that somebody is not who they say they are doesn’t necessarily enter into our thinking. So, it never entered into Charles’s thinking that she was somehow misrepresenting herself. Interestingly, in one of my favorite episodes that we’ve shot, in season one, it was the first time Liza babysits his kids and we sit and we talk, and she talks about writers and how suffering creates death in people. I have that great line, “Are you sure you’re 26?” I think he sees her as an old soul. Some people, by 26, have lived more than others. He takes her to be one of those people, and he’s very attracted to her for that reason, for that depth. Did Charles’s confrontation with Liza mirror the way you expected him to react? I can’t express my appreciation for our writers enough. I have to say, I was happy — ugh, “happy” is a word that always looks so stupid in print. I thought it was a great choice. [Laughs.] It was a choice that I really appreciated because he’s given this very human reaction. They leaned into how betrayed he feels, and they didn’t simply say, “We need to move the story along, we have to get these two people together, let’s have them talk it out and then they’re reconciled and off they go.” What he feels deeply is a betrayal, a breach of trust. I hoped that the writers would allow that to be there, and the way they constructed his reaction was beautiful. It’s an exciting place for a character to be. To your knowledge, did Darren Star and the writers always plan on Charles reacting this way, or were other potential scenarios tested out? I’m only privy to a small percentage of the mystery of the writer’s room, so I can’t say for sure. I don’t know if that was always the plan. They are so deft and nimble with the stories. Liza tells Kelsey — she’s the one who breaks the news to her — so the automatic next question is, “When is she going to tell Charles?” They turned that on its side and said, “Okay, he’s going to find out from somebody else.” That creates a new wrinkle and a new twist. If she wasn’t going to tell Charles, how was it going to happen? Can you walk me through filming that confrontation scene? I found it interesting that Charles was given a very human and curt reaction. Plus, it looked freezing outside. You know, for about three quarters of the season, whenever Sutton and I had scenes outside, it was guaranteed to be hovering around 30 degrees and drizzling. Without fail. It was unbelievable. [Laughs.] Earlier in the day it could’ve been 60, but then somehow the weather gods were like, “Oh look, they’re shooting outside, let’s drop the temperature!” It was crazy. So, yet again, it was a beautiful night out, and then we went outside and the temperature plummeted and it started to rain. It makes for great light, though. You have that beautiful New York City light shining through the moisture. We’re a cast who really likes each other, we’re really lucky that way. Sutton is so wonderful. Ugh, wonderful. Another boring word. As a person, she has such an abundance of humanity in her, and she was such a delight and a gift to do that scene with. Because you have two people who are deeply hurt, and you both open up and dig in and talk to each other, and then walk off sadly into the night. How can we expect their relationship to evolve? It’s a question of whether they can find their way back to something. How can you recover from this? It’s a betrayal. Is there an insurmountable wall that goes up, or it just a falling of an obstacle? They have to look at the pieces and decide if they want to build something. Not to spoil anything, but the writers tend to want to build things. There are some really, really good, complicated, layered, rewarding episodes ahead. I’ve chatted with Sutton a few times, and she brought forth an interesting theory about Diana — that she’s secretly known Liza’s secret from day one. Have you given much thought to how other characters, like Diana, would react if they also found out? I don’t know, to be honest. That’s a great theory, though. I was always curious how Charles would find out, obviously, but the way the writers did it is so much better than anything I thought might happen. I knew whatever they chose to do would be sublime. There’s that scene with Diana where her relationship ends in season four, a line in the script that says, “She collects herself.” That was the only stage direction. And she puts on this giant flower on her neck. What Miriam [Shor] did with that was so textured and beautiful and complex. I know whatever the writers will give her to play, she’ll swing for the fences and she’ll knock it out of the park, and I can’t wait to see it. She’s so vulnerable underneath, hence the armor. The way we see her hard-won mode of operating in the world, and the way she lets us sometimes see her true self that led her to operate in that way, is a delight to watch. I count my lucky stars every day that I get to work with her and everyone else. And you have another season to do so! I’m so happy. You and me both. Everybody was giving us very reassuring words about it, but it’s certainly lovely to hear it officially. We’re very excited that we get to be back. There’s so much story to tell. Now you just have to pull a Law and Order: SVU and go for at least ten more seasons. From your mouth to God’s ears, right? I mean, Mariska [Hargitay, Hermann’s wife] is at 20 now. It’s like when you’re on track and see one of the runners way down the track. She and I both feel very lucky.